When we started discussing about our trip to Europe, the first thing I was super excited for was – breakfast. To rephrase, breakfast in Paris. I am a sucker for all things loaded with carbs, and bread, is my weakness. I’m the person who loads up on free bread and butter in restaurants although a good main course is next. There is this Italian restaurant near my house that serves mediocre food but their whipped butter and fresh bread is killer. I LOVE that place. So obviously I was very psyched to try all the different croissants and baguettes. I’ve had my share of decent croissants but guys, believe the hype when I say that the French take croissants to a whole new level! The first day we decided to have breakfast at one of the many cafés that were strewn around our hotel. All cafés in Paris follow the same theme – red, they all have outside seating and EVERYONE smokes. The tables outside these cafés are placed so close together you could totally join in the conversations and pick food off each others tables without even stretching. One day we decided to have lunch in the outside seating area and this guy was blowing smoke in my face throughout the whole meal. It was unpleasant to say the least. While visiting most cafés we realized that the ‘locals’ had their coffee standing at the bar. We were the noob tourists “sitting down” for coffee. We later realized that coffee served at the bar is infinitely more cheaper than if you “sat down”. Its one of those “European” things that I don’t get. 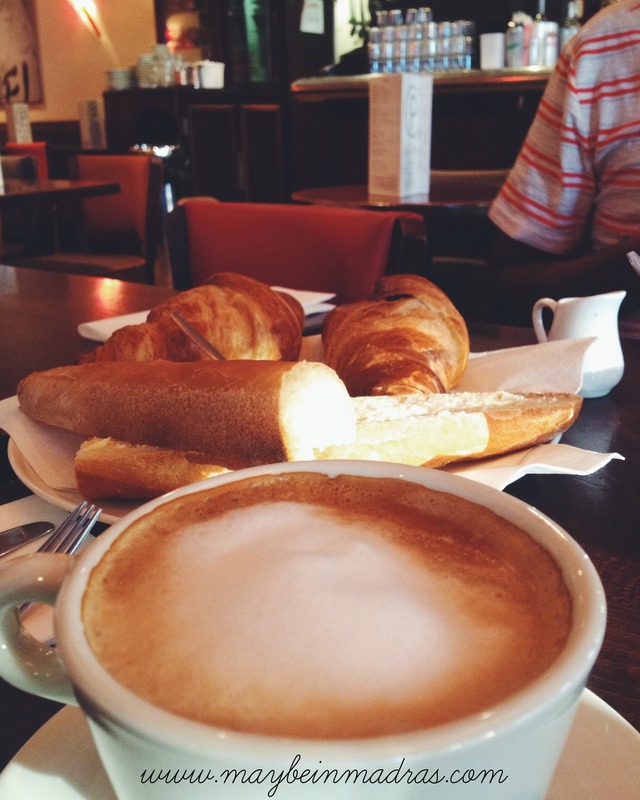 Most cafés have a set breakfast menu offering one of each treat – croissant, baguette, pain au chocolat. We tried the breakfast set for a couple of days and switched things up with the Nutella crepes (chewy, chocolatey goodness) and Norwegian smoked salmon with the fluffiest, creamiest, most decadent scrambled eggs I’ve ever had the pleasure of eating. 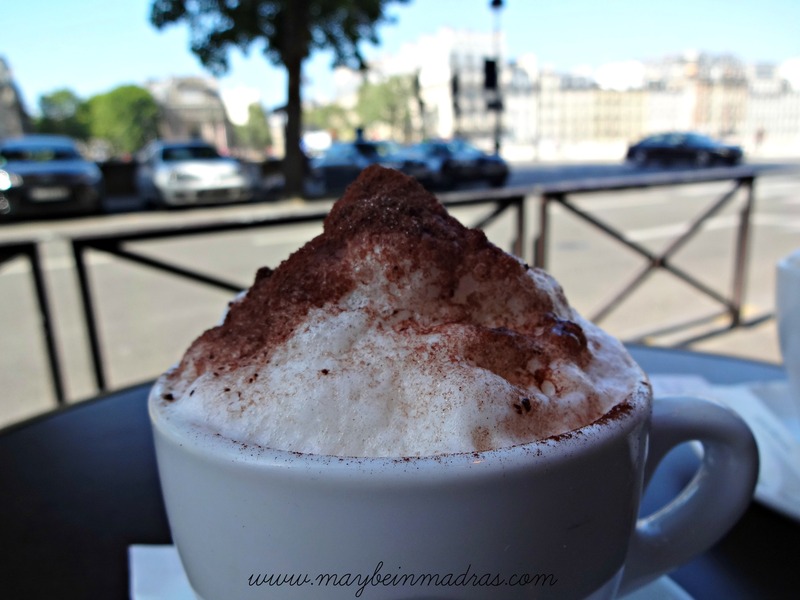 Coffee in Paris is good enough, but the coffee in Rome was the best. If you are visiting Paris first I’d recommend holding off a little on the food until you visit Rome, because that is where the magic lies. Now I’ll stop slobbering all over my keyboard and leave. There’s more from where that came from! Siigh.. they are so good, yet so bad! You were my inspiration on our Paris trip. I was eating so many carbs it was ridiculous! The croissants at the second Boulangerie we discovered were divine. Can’t eat the ready made stuff now. I knooow right! The bread there is just so so good!! Super fresh, and so.. crusty! I’m totally drooling right now! Ah woman. I am jealous. It seems like a dream!